Château de Béru is located in the small village Béru, to the east of Chablis town. It has been a property of the family of the same name since the 15th century. Athénaïs de Béru has been in charge since 2004, and now cultivates 15 hectares according to biodynamic principles. Montserre is made from a single vineyard on the flatlands of the valley, where the soils contain mainly limestone with fragments of rock. This wine was spontaneously fermented, then spent 3 months in steel and 3 months in old oak vats. There was no fining nor filtering, and no sulphur was added. Dark yellow, orange tones. Developed aromas of mature yellow fruits (mandarins, yellow tomatoes, mango), and a slightly bitter peel tone. Round and tasteful, quite powerful, and with a balancing acidity. 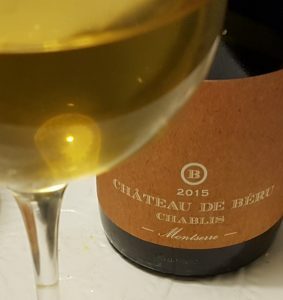 A cool wine from a warm Chablis vintage.